Measuring the human cost of the tough-on-crime policies of the 1980s and 90s has never been a simple task. Researchers have tried to show the impact by measuring how long prisoners spent behind bars before they were released. They found that time served has increased over the past decades. But that approach skips a whole group: People whose incarceration has been going on so long they have yet to get out. Now, a new study by the Urban Institute is trying something different. The nonprofit counted how long people currently in prison — many of whom still have long sentences to serve — have been there. Examining data from 43 states and Washington, D.C., the organization’s Justice Policy Center found that the average number of years in prison for the incarcerated has grown considerably in recent decades. In Michigan, for example, those who have been in prison the longest—the top 10 percent—had served an average of 10 years in 1989. By 2013, the longest-serving prisoners had been incarcerated for 26 years. 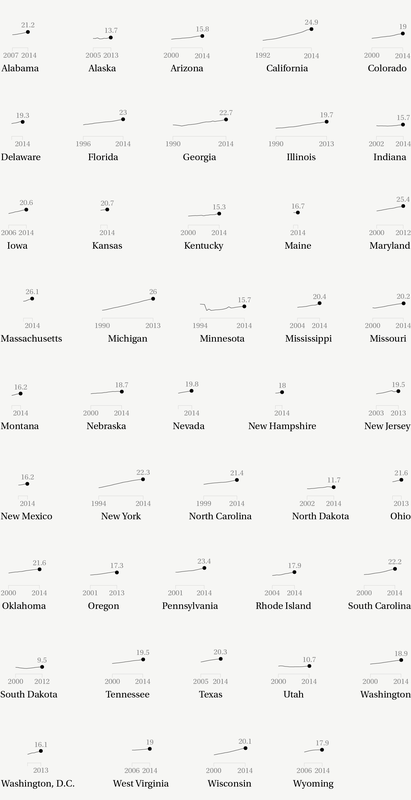 For the states that had data from 2000 through 2014, the average time served grew by about 37 percent. For the 10 percent who have been in prison the longest, most of whom received the harshest sentences for violent crimes, their time served rose by about 42 percent. Strikingly, the study found that nearly two out of five of those serving the longest terms were sentenced while they were still young — before age 25. Adam Gelb, director of the Public Safety Performance Project at The Pew Charitable Trusts, said he is not surprised by these numbers, which he sees as proof of a system gone awry. In the most of the 43 states and Washington, D.C. examined by the Urban Institute, the average number of years served by the top 10 percent of the longest incarcerated prisoners has increased in recent decades. The Urban Institute argues its numbers show that any effort to reduce the number of people incarcerated in the U.S. — now 2.2 million people — has to address how the criminal justice system treats people who commit violent crimes. Jonathan Simon, director of the Center for the Study of Law and Society at the University of California, Berkeley, said people of color are disproportionately convicted of violent crimes. “So not aiming for a reform focused on violent crime makes the present policies racially biased,” he said. The Urban Institute’s study seems to support Simon: The data shows racial disparities among the population serving long-term prison. Across all the states studied in the report, four of every 10 people in prison are black, more than the share of African Americans in the overall U.S. population. The number rises to almost five black prisoners in every 10 for those who are serving the top 10 percent of longest sentences. Experts said addressing sentences for violent offenses may be a more sure path toward reducing the U.S. incarceration rate, but it is a political minefield.